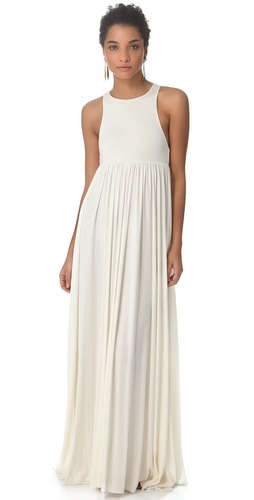 Now that spring has sprung, and the temperatures are beginning to rise, I’m in maxi-dress-love. They are perfect paired with a jean jacket, sweater, scarf, heels, or flats. They’re almost fool-proof, and a staple in my wardrobe. Here are a few of the dresses I’ve recently snagged, or am lusting over. I bought this for our family photos in May, and I’m literally in love with it. It’s so well fitted, and flows beautifully, and I know I’ll get tons of use out of this neutral dress all spring, summer, and fall. I can’t wait to pair it with a jean jacket and sandals. I’m loving the vibrant colors and cut of this dress. The delicate pleating around the waist creates a flowing movement, and the flared hem creates a more hourglass look to your figure. H&M Black & White Maxi (Only 29.95) - This would look amazing with a brown bow belt and brown gladiators. 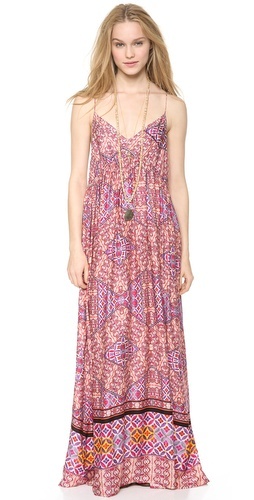 F21 Femme Flounce Floral Maxi - Under $25 – This dress should be illegal it’s so beautiful & cheap! F21 Rose Cutout Maxi (also available in black floral) – The back of this dress is gorgeous!! Under $23…DUH I’m buying it. I love the sheer skirt, and the leg slits. Perfect dress to show off a cute pair of sandals and tanned legs. Here’s a less expensive alternative to my Rachel Pally dress above. I’m also obsessing over maxi skirts, but we’ll have to cover those another day. I’m obsessed with maxi dresses! They are so easy to dress up or down and not to mention lightweight to pack!! Love! Ohmygosh I am OBSESSED with the first one! I love Rachel Pally. Her dresses are perfect. I have one I almost 7 years ago that I still love so much. It’s an LBD with straps that tie on and its cinched in the front with a bubble hem. Love maxi dresses/skirts. I practically live in them during the spring and summer! Going to check out some of these! I love your style! Maxi dresses are my fav thing to wear as of now since I’m pregnant. They are glam and comfy all at the same time.